Just like any other profession, the right tools can make all the difference to teachers. Here are my top 11 awesome tools that made teaching easier, better, and more effective. Lets face it, working in education is a difficult job. When I first started teaching in 2007, my most important technology tools were my old laptop and my overhead projector. You know the projectors with the mirror and plastic sheets? Many of you probably still use those gems. In today’s classrooms, teachers have a full range of computer and mobile tools available. Most are free and all promise to make your work so much easier. 11 technology tools doesn’t sound like a lot considering a novice mechanic needs 14. Yet, just 11 tools can make all the difference for teachers. On my list are 11 awesome tools that help out with my productivity or increase my student engagement, or even help keep my lessons focused and organized. Each of us need to pick the tools that work best in our own circumstances. So these might not work for everyone but take a look at what I use and see if there is something that might make your life easier. **Side Note: I have excluded Schoology and Google Drive from the list. I have written extensively on Schoology, like here and here. And Google Drive is another one of my key tools but now it is pretty commonly used. 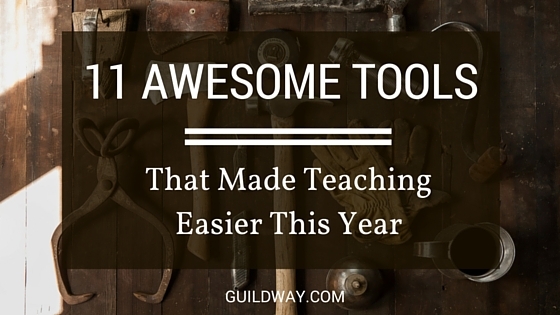 I chose my 11 awesome tools because they were a little more off the common radar of teachers. Hands-down the most important app here for me. I use it not just professionally but for personal reminders as well. It is my digital brain. I do everything from write lesson plans to record the various LED light bulbs I have at home. If I need to remember it, I tag it and file it in Evernote. If Evernote is my digital brain, Nozbe is my command center. Evernote keeps all of my material I have to remember. Nozbe is a free, robust, user-friendly to do list app. It is cloud based and seamlessly works with my Android phone, MacBook laptop, and Windows computer. It is completely compatible with the Getting Things Done system and I use it to plan out my tasks every day. Lesson planning, grading, meetings, home projects, they are all there. If you are looking for a to do list app, Nozbe is a great tool to start with. This handy tool is only available on Mac. But And save me without a doubt hours upon hours. In fact I have on record now at least 6 hours have been saved using this tool alone. What the tool does is allow me to take my common phrases, email, sentences, comments, and keyboard shortcuts for them. so when I’m grading essays or answering emails with common language, I already have saved drafts of the messages that I just quickly answered using certain codes. there is a Windows version that I also use called Phrase Expander. it works just the same just on Windows. I haven’t found an Android version that works with Chromebooks but if you have Mac or Windows this tool is an essential one. I was able to get a discount for you readers. Use the code GUILDWAY and get 20% OFF when you sign up. All of us have really long project lists. the trick is to be able to focus on one as you work. One of the tricks I use is to listen to music. I know that this doesn’t work for everyone but for me it really just allows me to focus in on one task as a time. focus at will is a website that offers scientifically backed playlists that I can use while working. I can set the built-in timer for how long I want the music to play for. Because I use the Pomodoro Technique, this is usually 25 minutes. When the time is up, the music winds down and I hear a nice little chime letting me know I get a 5 minute break. Productivity increased! Pear Deck is a tool is a free presentation tool that doubles as a tool for student engagement. I have wrote about it before during early testing but it turned out to be a major tool for me. I can make presentations right in Pear Deck and they are saved in my Google Drive. As I am presenting to students the presentation is mirrored right to their screens. I can ask embedded questions, send them to links, or have them take quizzes. All of this happens seamlessly during the presentation. Pear Deck also sends out a weekly summary of my presentations and engagement statistics. This highly appeals to my goal driven personality. I feel that this is one of the least flashy one of the most important tools I have used this year. Everyone needs a calendar but what makes Google Calendar great is that it works with so many different programs I use. Other apps and platforms can add dates automatically to my calendar. Google Hangouts are listed with the links. It gives directions to places I need to go. Automatically blocks off my availability. It even sends out automatic meeting invites and reminders. All of my lessons and blog posts are all scheduled out on my calendar so there are no surprises. Google Calendar is like a screwdriver, easily neglected but invaluable when you need it. Emails emails emails. an education there’s no shortage of email. Parents, administrators, parents, students. It comes from all angles. Slack is a chat program that I brought to my school in January of last year. It is a closed chat room for your team. The team can be as large or as small as you want. A department, team, an entire school, or maybe an entire district. It has helped my staff cut down on the conversational emails that just fill up inboxes. This is because Slack is more of a searchable, archivable, chat program more open than Google Hangouts but more closed than Twitter. Perfect for teams wanting increased communication but the protection of privacy. Gamification does not need to be a second job. if you want to increase the engagement of your students without a lot of stress I suggest classcraft. it turns the classroom into a year-long game. I helps me engage students in their learning more, give them a sense of progress throughout the year, and empower them with cool abilities in class. Students love it. By using this link you will get 2 Months of Premium Free. I love sharing cool articles that help other teachers. When I am teaching I want to stay focused on teaching. At the same time, I don’t want to bombard my followers with 100 posts at 7am before I walk into the building. Buffer is a free tool that allows me to space out my articles and posts throughout the day. They help me stay focused on teaching but also be online sharing the cool stuff I find. I wouldn’t be able to share as much as I do without this tool. I resisted Scrivener for a long time. Scrivener is a writing tool. I tested it out a long time ago and it looked really outdated. Besides, I did most of my writing in Evernote. The problem? Evernote is great as my digital brain but does poorly at organizing my writing. For writing, Scrivener helps me keep all of my thoughts, ideas, posts, lists all organized in one place. It makes drafting longer documents a breeze by helping me organize my thoughts and topics easily. Scrivener has made a more organized and focused writer. f you are writing a lot, try out Scrivener. This one is just for bloggers. It is kind of a particular tool but one that was really important to me this year. I am currently a one-man-show. That means I am fulfilling all the roles and responsibilities of teaching and blogging, and staying active on social media. Co-schedule helps me manage my blog posts and helps share them on social media. My productivity is increased because I don’t need to be everywhere at once! That completes my list of 11 tools that made all the difference to my teaching this year. There are many more I use but none were more important than these. Question: What was/were your most important tool you used this year? documents for plagiarism less than in 1 minute. This plagiarism checker saved a lot of my precious time! Thank you so much for sharing! Did you find that it was too critical? not critical enough? As for me, it’s not too critical, but it’s quite informative and describes the main features of the software in an impartial way. Very cool stuff, thanks for sharing it! Happy New Year Jen! I would agree that the webclipper is a life saver! I would love to find a way to closer intergrate Evernote with Schoology. I found an article I saved this article a while back. (https://discussion.evernote.com/topic/36465-killer-combo-for-education-evernote-schoology/). It was written in 2013 and talked about the possibility of the one day marriage of Evernote and Schoology. The dream is to have systems that just work well with one another. Hey Buzz, thanks for stopping by! As always, I am interested in products that help teachers stay productive and I was looking into ActiveWords and it looks promising. Can it pull from/sync with different phase banks? For instance, can it pull or add phrases [i.e. through Dropbox] from my TextExpander list? I’m not sure. Can you export from TE to say a CSV file? We sync to Dropbox so that you have the same ActiveWords on computers 1-n…that run Windows. But easy test is to get on GoToMeeting and see. let me know when you might have time to do it. And remember, 93% of computers in use use Windows. I see that there is a 60 day demo so I am going to give ActiveWords a shot! Thanks again for letting us know about your app. Also, Be sure to look at our various agents, e.g. http://www.activewords.com/plusapplications.html , and I have collected a lot of materials related to scripting here, e.g. http://buzzmodo.typepad.com/buzznovation/2006/03/activewords_and_3.html . It’s really about doing a little personal systems analysis, understand what you do often, and see if ActiveWords can automate or speed it up. I think the magic is understanding the power of “naming” computing events. I think you made a good point. The most important thing in a person’s workflow, personal or professional, is going to be organization. To reach peak productivity, we must spend a couple of minutes to first figure out our systems.